Spray drift of phenoxy compounds, and the subsequent damage to susceptible crops grown close by, is a major concern in vineyard and vegetable growing districts. More recently it has become important to broadacre farming due to the wider scale sowing of lupins, canola, faba beans and peas. The knockdown herbicides Spray.Seed® and glyphosate sometimes damage crops and native vegetation by spray drift. Small droplets have a large surface area in relation to their mass. They are therefore easily blown by wind. The higher the wind speed at the time of spraying, the more likely are droplets to be blown away from the target. Moreover, the liquid carrier may evaporate in hot dry conditions, thus reducing the droplet size in transit from spray nozzle to target. All spraying systems produce a range of droplet sizes, although the range produced by Controlled Droplet Applicators is much narrower than that of conventional hydraulic nozzles. Therefore, spray drift is impossible to eliminate but it may be reduced to acceptable levels. This can be done by avoiding spraying in adverse conditions (for example, during high winds and temperature inversions) and adjusting the boom spray operation. A recent development with nozzle design is air induction or injection. The air induction nozzle draws air into the system using a venturi action and then forms large droplets that are filled with air. These droplets because they are large do not drift as much as the small droplets. When they hit a target they then shatter into a large number of smaller droplets. This way the there is less drift, coverage of the target is still achieved when the large drops shatter into many smaller ones and the air filled drops do not bounce once they hit a target. Misters and boom sprays produce many small droplets. Misters should never be used up-wind close to susceptible crops. 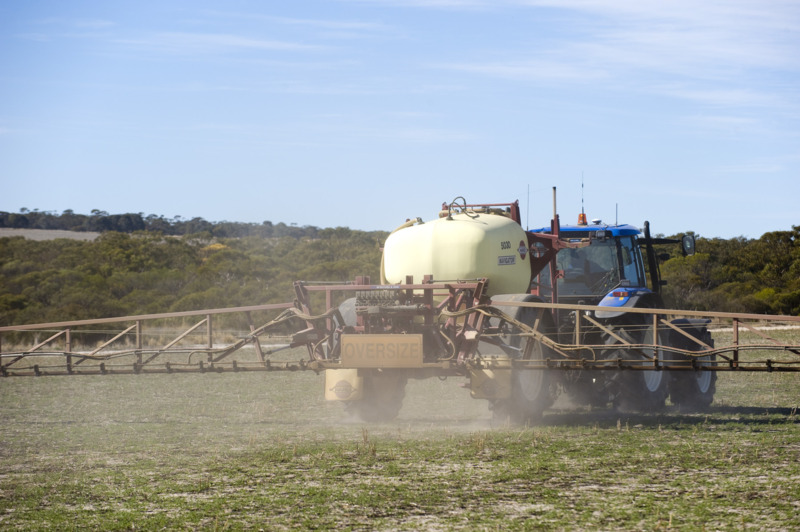 Drift from boom sprays may be minimised by manipulation of the sprayer nozzles (for example, air induction nozzles), spraying height, reduced spraying pressure and tractor speed. Airfoils above booms have also directed the droplets downwards towards the targets. A long droplet trajectory from nozzle to crop increases the chance of droplets evaporating. To minimise droplet travelling distance, choose wide spray angle flat fan nozzles (110º) rather than the narrow fan angle, for example, 80º, angled backwards at 45º and run the boom as low as possible above crop height. Vapour drift is a problem with certain chemicals, mainly the volatile ester formulations. The spray vaporises from the soil or plant surface after spraying and may drift many kilometres to damage susceptible crops. This mainly occurs under hot, dry conditions. It can be avoided by use of amine formulations or low volatile esters. Weather conditions affect both droplet drift and vapour drift. Avoid hot dry conditions and windy days. The best time to spray is in cool, moist conditions in the morning or early evening, but not when the weather is calm because then temperature inversion is likely which can lead to unpredictable spread of chemical droplets. A slight breeze blowing away from the susceptible crop is ideal. Bulletin 4243 ‘Management of Agricultural Weeds in Western Australia’. Reducing Herbicide Spray Drift, by Andrew Storrie, Weeds Agronomist, Tamworth Agricultural Institute New South Wales Agriculture Agnote DPI-477, January 2004 issn 1034-6848.